Hello, you’ve probably seen me around the neighborhood but you don’t know me personally so I would like to introduce myself to you. My name is Steve and my family and I live in the house on Brown Road. You live around me and I see you and your deer friend’s everyday around the area. Sometimes I see dozens of you, hundreds even, standing gracefully in the farm fields around us, just eating, and sticking your little white-tailed deer butts perkily into the air. Sometimes I see you in my yard, especially in the summertime when you and your deer friends like to come and eat the apples out of our apples trees. I enjoy watching you rear-up on your hind legs to reach those apples that are on the upper branches. You are very beautiful, Deer, and I still remember the first time my wife and I drove down to look at our house, coming around a curve in the road, to find you and a deer friend standing in the road staring at us. It was a very peaceful and idyllic scene and we knew at that time that we wanted to live in this place we now call our home. I will always remember the time, just recently, that I navigated a turn in the road to come face to face with a huge deer friend of yours, an elusive buck with a large set of full-grown antlers, worthy of royalty, standing face to face with me and blocking the road. As I pulled out my blackberry to try to snap a photo, he ran into the woods. I will especially never forget your young deer friend that used to come right up onto our property and play with our dog Clio. They would jump around and frolic together right in our gravel driveway. I suspect that deer friend of yours, being a little too comfortable around people and probably not on the top of Darwin’s survival list, may have been sacrificed during this latest hunting season. Sad… we enjoyed her company. Even though living in unity with you, Deer, can be very peaceful and rewarding, sometimes it can also be very challenging. Even so, Deer, we still appreciate you choosing to reside near us. I have learned not to get angry when I get stuck driving 5 mph behind the cars full of little old ladies and they’re white-haired husbands who are puttering around and staring at you, as if you are some kind of rare creature on an African Safari. I remember when we used to plant a garden and how you would, under cover of night, eat and destroy all of the vegetables that we had worked so hard to cultivate and although it made us frustrated we were happy we were helping to feed you. I was told by someone that I should urinate around the garden and that the smell would keep you away, but I thought that was weird and I didn’t want the neighbors to call the police so I decided not to do that. 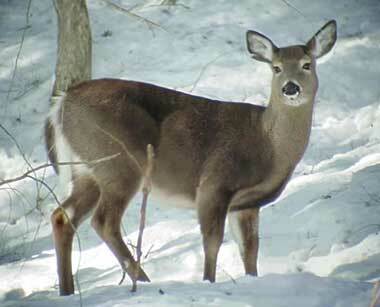 I distinctly remember the winter, about ten years ago that was so frigidly cold, with so many days of temperatures dipping below zero degrees, and months of heavily snow-covered ground, that you and your deer friends came up all the way to our house and stripped our shrubbery completely clean of every single green needle. Although that made us angry also, we knew, Deer, that you were hungry and that all of the food sources you usually ate from were covered and frozen. So we were happy to sacrifice our shrubs for you. We never liked those shrubs much anyhow. And I will always remember the first time I heard you snorting at me on a pitch black night as I was traversing the yard. I couldn’t see you, I could only hear the loud snorting noises you were making, and although it literally almost scared the crap out of me, I understood that you were a gentle creature and we’re only trying to stake out your territory and frighten me away. I have also come to understand, Deer, that you don’t come from the brightest lot and I have learned to work around that shortfall of yours. I remember the day, many years ago, that one of your deer friends jumped out into the road as I was driving briskly by and hit the back-end of my truck. I think that deer friend was okay that day because she just brushed up against the area where my tail-lights are and only left a small trace of deer hair sticking out from the corner of my bumper. It made me realize, at that point, that maybe you and your deer friends are not that smart and that, as responsible neighbors, maybe we should be more concerned about your safety. Then just a few years later, one of your younger deer friends literally jumped right in front of my truck. I remember hitting the poor fellow head on and his little body just flying right up in the air and over onto the side of the road. I stopped to try to find him, but it was dark and I wasn’t able to locate his body. Even recently, one evening last week I had to slam my brakes and swerve, on icy roads, to avoid smashing head on into one of your large deer friends. She, like the others, just leaped right out in front of my truck as I was driving. In fact, Deer, that happens so frequently now that it really has just become part of my daily routine and I have adjusted to those circumstances and it has improved my driving skills. Sometimes though, Deer, I wonder if I should just keep driving straight ahead and hit your deer friends, so as to not risk myself careening off the road and crashing into a tree. But I am an animal lover and my instinct just reacts in a way that risks my life instead of yours. I hope you appreciate that concern that I have for you. So, Deer, now that we have gotten the introductions and formalities out-of-the-way, I hope we can continue to live peacefully together. Although I approve of hunting to help thin down the number of your deer friends that are all too frequently leaping in front of my truck, I personally am not a hunter. Therefore, you don’t need to be concerned about me chasing you around the woods with a shotgun during those frightening two weeks of firearms hunting season in November. In fact, during those days I prefer to stay in close proximity to my own home so as not to get shot myself. I reckon that is something we have in common, not wanting to be shot by a guy in an orange camo jumpsuit. With that in mind, Deer, maybe in return for me not trying to hunt you, you could try a little harder not to run in front of my truck. I know that sometimes I may drive a little too fast, but I believe if you could just hang tight on the side of the road for just a few extra seconds and let me pass, that we would both be better off in the long run. If we could agree on that, Deer, I’d also be okay with you continuing to eat my apples and other things around the property, assuming there is anything left once that goats get to it all. Thank you, Deer, for your continued partnership in living a peaceful, country life. I look forward to many more years of our mutually beneficial relationship. When I lived in the country, I did everything I could to keep them out of the garden. Now that I live in the city, I do what I can to attract them. Apparently I am never satisfied. Unfortunately, with time constraints we no longer have a garden, so I don’t need to worry too much. Also, with the goats around and the 180 lb St. Bernard they don’t come onto the property as much as they used to. I do love having wildlife around too, even though they can be a PITA some days! I would be like one of those old ducks on an African safari! That was awesome! I actually cant believe that you have really hit so many. I thought that it was something that happened, but rarely. Lucky you have a truck!!!! Thankfully my two hits have been minor and caused no damage to my truck. But yes it is very common and can really mess up a vehicle. They really do just leap out right in front of you, its frightening sometimes. And you always know that if there is one running across the road there are probably a few more behind that you can’t see yet. I just checked Michigan State Police website and it says there are over 60,000 reported car-deer accidents every year, just in Michigan, and that’s just the reported ones! They are beautiful…don’t know how people cam kill them. They come in our backyard all the time. Took some great pics of some just last weekend that are up on my social site if you want to see them. There is a link to it on my blog! I don’t know how people can hunt them either.. or anything for that matter. That’s just not my thing. But I do think it is necessary to thin the herd’s out. If there was no hunting I’m not sure the deer wouldn’t overtake us! I dont know why it is but as I read this post, The narration voice in my head sounded a bit like Jonny Cash speak-singing with guitar music in the background. You know… like those country tribute songs about sunsets, mothers, or how great America is? When we first moved to the Red House, we loved it when one or two deer showed up in the yard. Many years later, with a herd of 50 of them stomping through and eating everything in sight, we are not so amused. We are waging all out war: (http://gogreygirl.wordpress.com/2011/01/24/the-browser-war-1/). We won’t harm them, or kill them, but we will make sure they understand that our fenced in back yard is off limits!